Roto-Die Hydraulic Brake | Capabilities of Roto Die Hydraulic Bending Machines | Cincinnati Precision Machinery, Inc. The innovative design of the ROTO-DIE Hydraulic Bender incorporates the "Most-Wanted" features in Sheet Metal Fabrication. 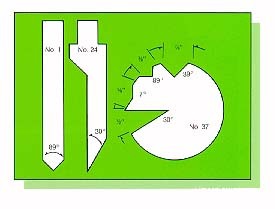 All basic metal shapes formed without die change or major adjustment. Precision depth-OfStroke indicators permit recording initial settings for repeat reference. Parallel bed and ram assures multiple precision bending over the entire length of the bed without adjustment of the truss bars and rods. Full wrap-Around box and duct forming from either end of the machine. Smooth hydraulic power for safe, constant forming speed with no whip of large sheets. Automatic protection from jamming, over-Load and operator negligence. Centralized tonnage control standard. Fail-Safe design automatically returns ram to "UP" position in the event of an electrical or hydraulic failure. Rugged construction for long, trouble-free operation in heavy-duty service. 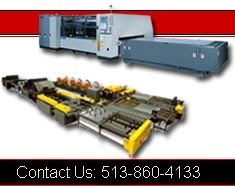 Contact Us About Roto-Die Hydraulic Sheet Metal Bending Brakes.